Ylang ylang essential oil which is also known by its scientific name – Cananga odorata is derived from the petals of a large tropical tree. The name of the tree actually means ‘flower of flowers’ and it was named because of its incredible sweet floral aroma. Ylang ylang is actually one of the major ingredients in Chanel No. 5 perfume. For many centuries, ylang ylang has been prized for its ability to heal the skin and to thicken the hair. It has also been used for many years in South East Asia most notably in Indonesia as a bedroom decoration for newlyweds because of its alleged aphrodisiac qualities. These days, the ylang ylang trees grow widely in tropical areas of South East Asia like the Philippines, Indonesia and Malaysia. They can also be found growing on the Pacific Islands. Its delightful, floral aroma is generally considered uplifting and romantic which is why so many people enjoy diffusing ylang ylang oil around their homes and in the bedroom even when they are not necessarily trying to treat a particular complaint. The composition of Ylang Ylang can vary greatly depending on the origin. If you find a brand you like itis probably best to stick to it as the composition of another brand could be significantly different. In terms of its therapeutic ability, ylang ylang possesses antiseptic, antidepressant, sedative, nervine, hypotensive and aphrodisiac qualities among others which gives this essential oil its range of therapeutic applications. When it comes to controlling blood pressure and protecting the health of your heart, there are few essential oils with more impressive credentials than ylang ylang. This oil can improve circulation and the flow of blood through the body and recent research into its effects on blood pressure has been extremely promising. If you are suffering from high blood pressure or heightened pulse rate, try diffusing ylang ylang oil throughout the day and near your bed at night. Ylang ylang can do wonders for your skin’s health and appearance. It can help preserve the youthful look of your face and body and help to rejuvenate areas of the skin that are looking tired and old. Many people add ylang ylang to their skin care routines by simply adding a few drops to their skin creams and body lotions. Alternatively you can dilute a few drops of your ylang ylang oil with a skin friendly carrier oil like virgin coconut oil and apply it to your face with a cotton ball once or twice a day. So many people suffer from the crippling effects of depression as well as other emotional issues like stress or anxiety that a safe and natural alternative to the often dangerous and addictive range of pharmaceutical drugs is something of a priority. Many sufferers have found solace in essential oils because they provide a natural and far safer alternative and ylang ylang may be one of the most useful of all the essential oils when it comes to improving your emotional well being. Ylang ylang has long been used in aromatherapy to relieve symptoms of depression as well as stress and fatigue and researchers have started to investigate the efficacy of these claims. Other studies have demonstrated similar effects and I find them extremely re-assuring despite the fact they don’t get the publicity they deserve. If essential oils can have an impact on emotional well-being, then this alternative treatment deserves all the publicity it can get. This benefit is linked to its emotional benefits but if you find that you are constantly fatigued and drained of the necessary energy to get through the day then ylang ylang can be a real help. The scent of this oil is invigorating and energizing and can give you just the boost you need to face the day ahead. To bump up your energy levels, you can inhale your ylang ylang oil directly or from a diffuser. Another option is to dilute a few drops with water or a base oil and apply it to your temples, wrists and neck. Ylang ylang is one of the many essential oils that can really give your hair a lift. If you simply need to condition your hair or want to get rid of dandruff then consider adding ylang ylang essential oil to your hair care regimen. To treat your scalp and hair add a few drops to your regular shampoo or dilute it with a hair friendly carrier oil like virgin coconut oil. One of the traditional uses of ylang ylang essential oil is to stimulate the libido and put you in the proper mood for intimacy. Ylang ylang has a fragrance considered by many to be romantic and it has a long history of use in South East Asia as a sexual stimulant for both men and for women. There is no research available regarding its ability to boost libido so we have to rely on anecdotal evidence and history. Despite the lack of evidence, certain fragrances can have a real impact on mood including sexual desire and there is no harm in giving it a go. Try diffusing it in the bedroom at night time or adding a few drops to the pillow and let us know if it had the desired effect. There is ample evidence that feelings of anxiety and stress can have a very negative impact on your digestive health and because of ylang ylang’s ability to improve your mental wellbeing, it can be used to improve digestive symptoms like indigestion, constipation and even improve your appetite. If you are suffering from poor digestion, try massaging a few drops of diluted ylang ylang oil into your stomach whenever you feel the need. There is little or no scientific evidence that it works but many people find that massaging diluted ylang ylang into their body can help relieve the pain associated with diabetic neuropathy. It is possible that the anti-inflammatory properties and improved blood flow (which has been studied) helps with neuropathy. Many women experience symptoms during their menstrual cycle, some of which can be extremely painful and debilitating. Among the most common symptoms are cramping, bloating, mood swings and headaches. Fortunately, ylang ylang essential oil can offer some natural relief. Because ylang ylang has a proven ability to combat stress, it can be used to relieve emotional issues associated with menstruation, It is also an excellent topical remedy to relieve pain and cramps that so many women suffer from. To relieve the symptoms of menstruation, either inhale ylang ylang oil or dilute it and massage it into your belly and neck. Ylang ylang essential oil has certain anti-inflammatory and soothing properties that make it the ideal natural remedy for muscular pain. You can either dilute your oil with a carrier oil and rub it into your body or ad a couple of drops to your bathwater, sit back and let it wash over you. Either way, it should make an enormous difference and get you ready for the day ahead. A clinical study compared to Ylang Ylang and Lemongrass Oil to DEET and IR3535 (Johnson’s Baby Clear Lotion Anti-Mosquito). Both herbal oils were superior to IR3535 but not as long lasting as 20% DEET. The Ylang Ylang was good against mosquitoes for about 88 minutes vs 155 minutes for DEET. Inhalation: you can either inhale your ylang ylang oil directly from the bottle or from your cupped hands whenever you are feeling low or stressed. Diffusing the oil throughout your home and office will have a similarly beneficial effect. Topical application: for the purposes of body massage or skin treatment, make sure that you dilute your ylang ylang oil with a suitable base oil before applying it to your skin. Even after dilution it is sound advice to perform a patch test on a very small area of skin to ensure that you do not react adversely. Bath: add a few drops of ylang ylang to your bathwater to help combat menstrual pain or to give you the lift that you need when you are feeling down. This wonderful oil will also do wonders for your skin when you take the time to soak it up. Blends: ylang ylang essential oil blends very well with a number of other essential oils. As we have already seen, studies have demonstrated that it goes very well with lavender, bergamot and lemon to treat high blood pressure, heart rate and to relieve tension and stress. It also blends very well with jasmine, frankincense and sandalwood as well as the citrus based oils. For anxiety and stress try combining a few drops of ylangy lang with an equal amount of lavender and bergamot. For sexual desire, try making a massage oil with an equal amount of ylang ylang and sandalwood combined with a suitable carrier oil. To increase your energy levels, try combining ylang ylang with an equal amount of a citrus oil like lime, lemon or grapefruit. With all these uses, I am sure you are wondering whether or not this oil is safe to use. 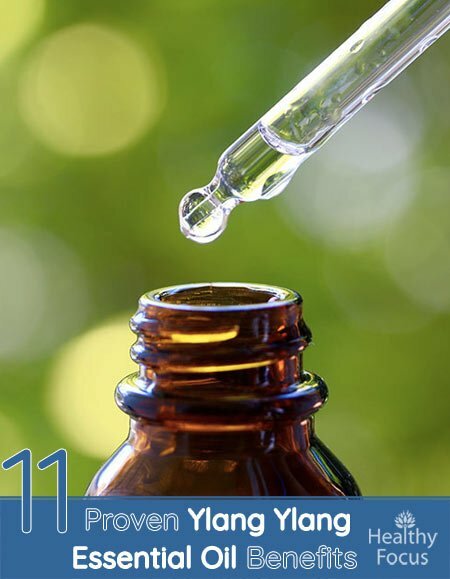 The good news is that when used correctly, ylang ylang essential oil is considered safe and non-toxic but there are a few precautions that anybody using it needs to be aware of. While ylang ylang is possibly safe to be used internally, we can’t recommend ingesting this or any other essential oils because of the lack of research into its safety. You should not apply ylang ylang oil directly to your skin unless you dilute it first with a base oil. There are numerous carrier oils to choose from but even after dilution, you should ensure against reaction by dong a small patch test on your skin. If you don’t experience a reaction then you can go ahead with a larger application. Because of its proven ability to reduce blood pressure, you should avoid using ylang ylang essential oil while you are taking blood pressure medications. There is no evidence that ylang ylang is unsafe for pregnant women or breast feeding mothers but you should still exercise caution and consult your doctor if you are in any way concerned.